Do you need a duplicate file deleter freeware product that can find and delete duplicate files on your computer ? Duplicate Filter can be your best free duplicate file deleter, which can instantly find, compare and manage duplicate files in your computer and network computer's shared folders. You can rename, move or remove duplicate files from computer after finding duplicate pictures,photos, images, mp3 music, songs, video files, documents and other files. Look for duplicates or similar files in any folders by CRC (same content), CRC+Name (exact), Name and Size,etc. Free download and free scan! Work with most Windows platforms including Winows 7. The best free software that finds duplicate files instantly. Scan your computer or shared folders on networked computers to see if there are any duplicates that are same or similar to a specified file. Duplicate Filter is the best software that deletes duplicate files. You can rename, move and delete your selected duplicate files easily. You can instantly find out a duplicate file in results by inputting part of the file name. In the free version of this duplicate deleter software, you can remove duplicate files you checked. Duplicate Filter is not only a file duplicate deleter freeware, but also a handy program to check whether two files are identical by using CRC32 comparison. This files duplicate deleter software also allow you to find the biggest files that occupy your disk space, and delete useless large files. Free up your hard drives. The free duplicater deleter software has a permanent free version, which allows you to make a free scan for your hard drives to locate all the duplicate files and the largest files, then remove those unwanted files. Definitely, you can upgrade this easy duplicate file finder to a pro edition to use more powerful functions. Why do you need a duplicate deleter freeware ? In the internet world with fast technology changes, when computers allow you to store billions of files in your hard drives, it becomes more and more difficult to find the information or files we need. The large amount of free space on hard drives allows us to copy millions of images, photos, pictures and music to it, and then more and more. Or you can download many files from the network without thinking much whether you already have these files, music or video. As a result, a lot of duplicate files are stored on your PC, which waste your hard disk storage so much. You will think "do i need a duplicate file deleter program to delete lots of duplicate files ? " or "how do i remove duplicate files from my computer ?" Sometimes you will think about a way to increase your disk space, for example, to buy an external hard drive, or upgrade your computer with a new larger size hard disk. However, buying new hardware will always cost you money, and keeping so much redundant and unneccessary files is always a waste of valuable hard disk space. You have to eliminate these duplicate files to regain valuable diskspace and improve data quality. But how to delete duplicate files? How to erase such double files? It is hardly possible to locate and delete duplicate files manually.Is there any free duplicate photo remover software or a duplicate picture eliminator freeware ? Idealy, if there is a duplicate file finder free download available on the Internet, then users can download the free software program to make a free scan immediately for their computer, then automatically find duplicate files. The duplicate file removal freeware can also allow users to delete duplicate files. Here is the perfect handy software tool: Duplicate Filter – a special program for deleting duplicate files, free! No matter you need a duplicate picture deleter or a duplicate mp3 deleter, this files duplicate deleter freeware is the best way to delete duplicate photos and music. Duplicate Filter freeware can performs a byte by byte scan on all of your duplicate files, and this is the only way to be 100 percent sure that the files are true duplicate files. This scan makes Duplicate Filter safe to use, so you can be certain that no files that are not identical will be deleted. If you want a duplicate photo deleter to find and remove duplicate images even they have different file names, Duplicate Filter is a good fit for you. So, please try this freeware duplicate file deleter tool: Duplicate filter, which can indeed help you solve the issue like "how to remove duplicate files from my computer". Afer you install Duplicate Filter software which will be the permanent freeware, you can easily search and delete files duplicates in one click with Duplicate Filter. If you want to delete duplicate photos or multiple documents or repeated files any other types, Duplicate Filter is the best option for you to delete duplicate files, free !. From now on, you don't need to go to cnet to find a duplicate file deleter software, Duplicate Filter is the best free duplicate file removal tool for you! On your pc many duplicate files get created over years, that occupies considerable amount of harddisk size and you are not aware of these unnecessary duplicate files. The Dulicate Filter freeware helps you identify duplicate files in one or more folders. You need to define search location to refine your search to find duplicate files, pictures, photos, mp3s, songs. You can find out these repeated or similar files in any folders by Cyclic Redundancy Checksum (CRC), CRC+Name (Exact), Name and Size,etc. Program compares the binary content of files and marks as duplicate files those are identical in contents. Therefore, this software can be your duplicate picture deleter to identicate some big-size pictures with different file names in different folders, then easily remove them. Once you know the duplicate files, you can rename, move and remove your selected duplicate files easily. You can instantly find a duplicate file in results by inputting part of the filename. The duplicate file deleter freeware is easy to use, and will perfrom efficiently. When you use your desktop or laptop for a few years, you will have a lot of unnecessary duplicate files. Then you will have to find a resolution for these matters: How to remove duplicate files from my computer ? How do I delete duplicate files on laptop ? what is the best free duplicate file delete to remove my duplicate files on pc ? Which is the best way to free up computer space ? Try Duplicate Filter! It is the free program to delete duplicate files on your computer. It is a good idea to scan for duplicate files in order to save hard drive space. Videos, music, photos and documents are some of the largest types of files and searching and cleaning duplicates can save you a lot of space! This duplicate deleter software has an simple and friendly interface, all features are easy to use. You can find and delete unwanted duplicate files on your local drives or network computers. Even though there are many duplicate file deleters in the market available for free download, for example, easy file duplicate finder, which is not good as Duplicate Filter. Because other products are too expensive, and only have free scan but do not allow you to remove duplicate files. 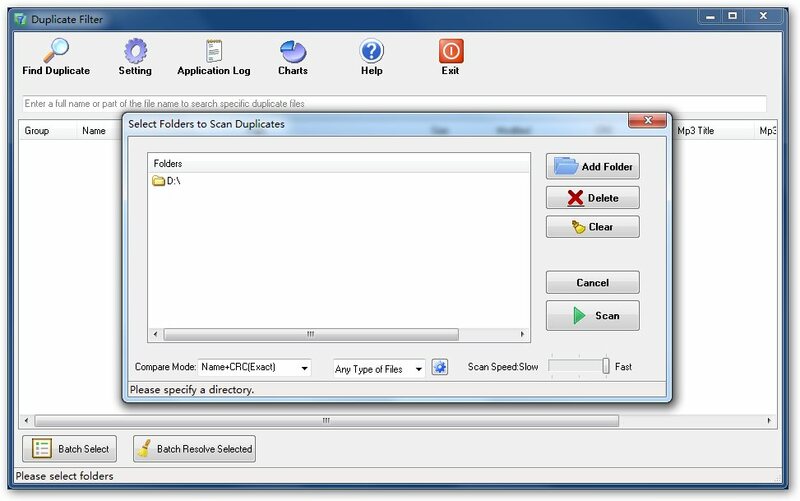 Unlike other duplicate file deleter programs, Duplicate Filter has a completely freeware version to allow users to have free download, make free scanning, and even delete duplicate files on computer. Duplicate Filter can run faster than those duplicate finer software, and generate accurate reports of duplicate file scan. And Duplicate Filter is a true duplicate file deleter freeware and the best programme to remove duplicate files from your pc or laptop. Duplicate Filter supports most Windows systems including Windows NT 4.0, Windows 2000, Windows 2003, Windows XP, Windows Vista and Windows 7. There are various reasons why duplicates are generated, but no matter what these reasons are there is not much sense in storing them. Duplicate Filter is a duplicate file deleter freeware that comes with all the functions you might need for performing the task of finding and deleting duplicate files. It is for free download! It will only take several minutes for Duplicate Filter free software to locate file duplicates, depending how many folders and files you will scan. Start the application and press the Scan key to do it. While the program is finding for duplicates, you will find this is the best way for you to find duplicate files in your computer: fast, easy, and reliable. The duplicate file remover software is a freeware after you download and install the program. You may also to upgrade the freeware to a pro edition to use more features. Please try this duplicate file deleter freeware for finding and removing all file duplicates! Benefits of Duplicate Filter Software ? Delete duplicate files you don't need with this fast duplicated file deleter freeware. Duplicate Filter is a free program to delete duplications on your computer. Find Duplicate Pictures, Photos, Images, Audio and Video Files, as well as the Largest Files. Find duplicate files and larggest files in seconds with this finder freeware. Archive duplicate files easily. Scan each folder to find the largest files, and delete those unwanted files! Find and remove duplicate files freeware. Free up disk space with this free duplication file cleaner to increase disk space. Compare files by CRC (content) to check file similarity with this crc comparison tool. You can also evaluate this feature in the free version of Duplicate Filter software. You may register the Pro version to try it with no limit. The professional edition is the best duplicate file deleter software. If you need a freeware to delete duplicate pictures, please download Duplicate Filter and install it ! It is a free duplicate photo deleter. You can easily find and delete duplicate jpgs, jpegs photos.